Our responsibility to employees, partners, customers, the environment and society means we monitor all activities and materials for environmental sustainability and reusability. We only use environmentally sustainable technologies and materials and employ our own sustainability officer. Combining an ecological vision with economic considerations — that's our goal. The Ecological Management and Audit Scheme (EMAS) is the world's most sophisticated system for sustainable environmental management. It contains all the requirements of the ISO 14001 international standard. In addition, it puts the focus on reporting and therefore transparency of improvements in environmental performance with the use of key data, as well as the involvement of employees and legal compliance. 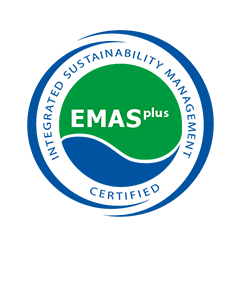 The EMASplus guideline is based on the EMAS regulation and additionally considers economic and social aspects of business activities. Here, it’s oriented on ISO 26000, the internationally recognised guideline for social responsibility. Zeeh Design GmbH stands for unique brand experiences. We provide a sophisticated appearance for companies in a wide range of industries – for trade fairs, events, general meetings, product presentations or roadshows. This attractive service has ensured success for Zeeh Design GmbH for more than three decades! We offer our customers tailor-made solutions that meet the highest standards of individuality, quality and safety. The interdisciplinary interplay of creativity, innovation, design and craftsmanship enables us to develop outstanding brand architectures. Our "Excellence Offensive 2020", which we launched to ensure the long-term competitiveness and future viability of the company while systematically increasing its value, also contributes to this. All our business models employ innovative processes and are designed to be goal-oriented. As a result, we focus on our customer’s goals to such an extent that our activities communicate the customer brand message. It's always about customer benefit: customer satisfaction is not enough for us — our aim is to exceed your expectations. To achieve this, we build value-creation chains that connect us closely to customers, agencies and suppliers. With these and other service providers, we foster partnership-based cooperation designed to endure. In the interests of society, we continually work to enshrine ecologically and socially credible behaviour in our strategy. This awareness of responsibility is of great benefit to our company. We not only create competitive advantages, but also ensure stability and a market-leading position for the future. This company policy of sustainability is and has always been the guiding principle of our company. We constantly improve our procedures and processes, taking care to adhere to our values, rules and standards. One way of achieving this is our "Excellence Offensive 2020", which will introduce a quality system that enables intelligent and smart planning. Macro trends dominate the global economy: urbanization, globalisation, climate change and digitalisation. These create new demands for communicating with our customers. Consequently, we extend the relationship with our customers further to identify their needs early and proactively develop our fields of business. The high level of performance we deliver in project management and brand architecture gives us a strong market position while integrating sustainable criteria. Plus, it results in a tailor-made portfolio of corresponding offers and services. We’ve established specific goals and principles as well as our social responsibility within the company. These values are based on United Nations’ "Global Compact" initiative founded on human rights, health and labour standards, environmental protection and preventing corruption. Our corporate culture is also based on this foundation; it shapes our overall concept and code of conduct. Zeeh Design GmbH is a premium full-service provider for live communication. The company implements professional brand architectures and corporate appearances – at trade fairs, events, press events, road shows and general meetings. Zeeh Design GmbH also specialises in concept development, design and consulting for these events for companies all over the world. Through our code of conduct, we are committed to working sustainably. This means that we constantly improve our processes in all business areas to meet the highest economic, social and environmental requirements. Cost-effectiveness, quality and reliability form the cornerstones of our company. In the same way, we’ve set minimum requirements that our employees, suppliers, service providers and partners must meet. All employees are continually trained to meet legal, economic and organizational requirements, — because everyone in the company carries a high level of responsibility for themselves and for the team. Added to this are attractive working conditions, individual freedom and career prospects. A central concern is the satisfaction of our customers, who profit again and again from our high rate of innovation. In doing so, we engage in intensive dialogue with them and focus completely on their wishes and needs. The "Excellence Offensive 2020" will pave the way to lean, flexible processes. As a result, we’ll improve our performance on an economic, social and ecological level and succeed in linking design, digitalization and project management in all project stages. In this way, we’ll clearly differentiate ourselves from our competitors and create the basis for organic growth. Our employees live our corporate culture, which is characterized by professionalism, creativity, openness, willingness to take responsibility and fair play. These are the fundamental values that every employee in our team embodies. They assume responsibility for themselves and for the future of the company, combined with a particular willingness to perform, think and behave entrepreneurially as well as a marked willingness to innovate. Supported by the idea of sustainability, the further development of this important culture is necessary to secure the existence of our company. In light of this, we offer customised services, full of fresh ideas and in keeping with the times. The health of our employees is very important to us. Which is why we ensure on an individual level that they are provided with a healthy working environment — over and above the requirements of normal occupational safety. Because the successful creative culture in our company is built on our employees. Similarly, we are committed to minimising the burden on the environment and climate. In creation and project planning, we pay attention to the careful use of resources. Trusting and fair — that’s how we work together with our business partners. As far as our suppliers and service providers are concerned, we prefer companies that are proven to work sustainably. In addition, we strive for regional cooperation, whereby recognised approvals and environmental certifications are important to us. It’s crucial for us, however, that human rights are unreservedly respected worldwide. We won’t tolerate any behaviour that involves discrimination, personal harassment or insult. Request our code of conduct.